* Let the Celebrations Begin! Saturday is going to be the start of several special weeks in Italy. On Saturday, Fincantieri will hand over Costa Diadema to Costa Crociere (Carnival Corp) at their Marghera yard. Costa’s CEO Michael Thamm and Fincantieri’s CEO Giuseppe Bono will be attending and doing the receiving and handing over. 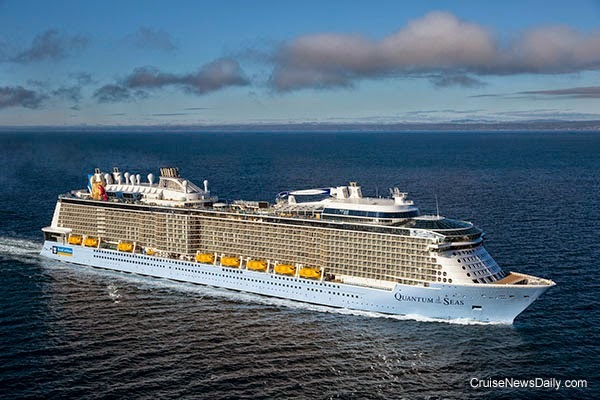 The 132,500-gross ton Costa Diadema is the first of a new class of ship, and the largest in the Costa fleet. It is also the largest cruise ship flying the Italian flag, so the next few weeks will be a time of celebration everywhere Costa Diadema goes in Italy (and beyond). 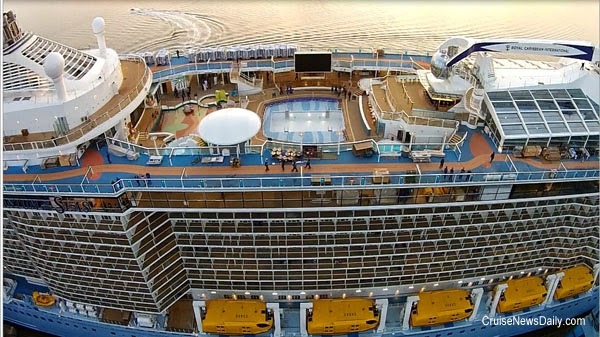 A look at how the folks at Makr Shakr created the bionic bartender aboard Quantum of the Seas. 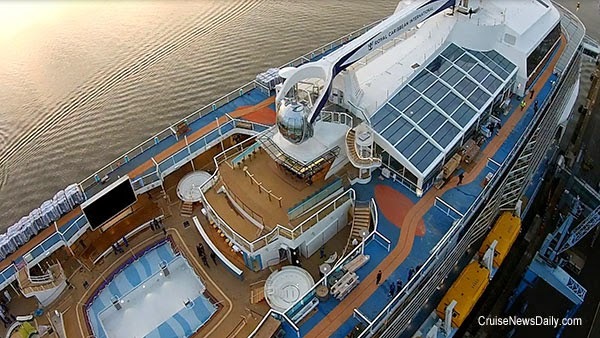 Over the past year or two we’ve been telling you about several concepts that are emerging in today’s cruise industry. 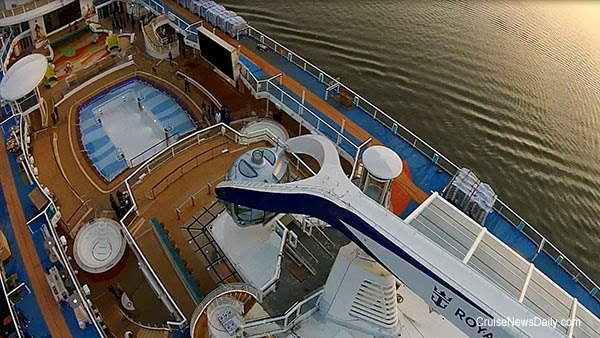 Today, Royal Caribbean reported a good third quarter, and in their earnings call, chairman Richard Fain discussed the results and looked forward. 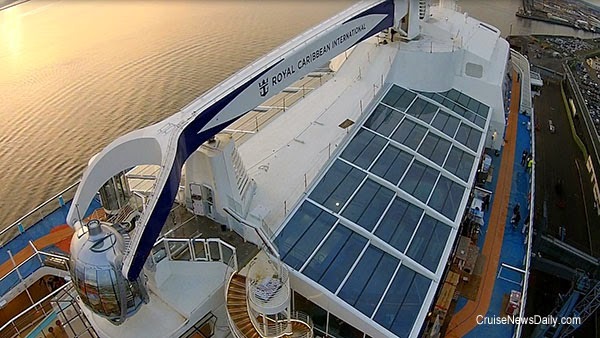 As he talked about how strongly Royal Caribbean was performing and the positive outlook for the future, it was evident that it was a result of how these concepts are working in the real world and making for a very profitable company. before her launch on 20 September 1967. 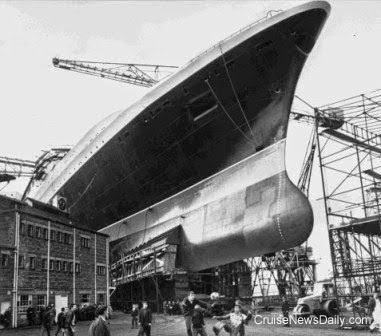 23 October 2014 – Preparations for the launch of the new Cunarder at the John Brown & Co shipyard on the Clyde – known as “Q4” by Cunard Line and “736” by the shipyard – had been going on for some weeks before the big day of 20 September 1967. It was planned that the new liner would glide toward the river at 22 miles an hour with the last shore fetters, the massive drag links, running out in a thunderous roar. There were ten bundles of them on each side of the ship. Each weighed 70 tons – 1,400 tons in all to steady the liner’s slide into the river and on to the sea. The ship was expected to be gliding at 19 miles per hour as she hit the water, pushing away 20,000 tons of water – her own launching weight. About 150 men would be aboard the empty shell ready for any emergency, and 161 men would work ashore to ensure a smooth launch. The intricate launching calculations had been worked out by a computer, reducing a week’s work to 30 minutes compared with the normal methods, with the slightest error having to be eliminated. Many factors had to be considered, for the river was narrow and the ship was long. The problems of a launch of this size were enormous. Very early on in the proceedings, the John Brown shipyard had to decide the width and slope of the slipway on which the liner would slide down to the water. The effects of temperature on the launch lubricant grease mixture had to be considered. A host of other factors all had to be checked, evaluated and checked again. John Starks, assistant managing director heading John Brown’s design team, described the process in detail. “The first step is, obviously, to make sure that she will move. When she starts to move, the first thing that starts to happen is that the stern begins to lift. As it does, pressure on the forward end of the slipway is increased very considerably as it is taking the whole weight of the ship, apart from any buoyancy that the water is taking. One must, therefore, make sure the ship is then strong enough to take the stress at the forward end. “You also have to ensure by calculation that the ship will float off the slipway as opposed to dropping off. And you also have to make sure she is waterborne while she is reasonably clear of the slipway. The next thing you have to decide is how far the ship can be expected to travel, and you have to decide what drag chains you are going to attach at what points to prevent her from going too far. “What most people do not appreciate is that the ship takes a very rough ride during its launch. She bends during the course of the launch and we have to make sure that all her structure is absolutely sound. We therefore inspect the ship very carefully. She probably gets far more local stresses during the launch than she ever will during the course of her working life. “The most critical factor by far in the launch is the depth of water available at the aft end of the slipways. The River Clyde is extremely temperamental: sometimes the water is deficient and sometimes it is excessive. If we have too much water, the danger is that the ship will really be afloat before she is clear at the end of the slipway and the problem with that is that, since high water is usually associated with high wind, if she is not clear at the end of the ways, she could damage herself on one of the cranes. The problem usually solves itself because, if the wind and water are that high, it is obviously no condition in which to launch a ship. This happens very infrequently and is obviously something to be avoided. But nevertheless the potential problem is still there. The man responsible for the slipway was Robert Craig, head foreman shipwright. He had worked at John Brown’s since he left school in 1918, and “Q4” would be his 47th launch as head foreman. He built the slipway from the information given to him. Its declivity (downward inclination towards the river) was one half inch to the foot. Every square foot of the sliding and standing (fixed) ways were to bear a weight of more than two tons. Craig he claimed for “Q4” it was 2,089 tons. Craig used 16,300 feet of 12-inch square timber to build the supporting poppets (cradles) at each end of the ship. Once the ship rested on 300 keel blocks but these had now been knocked away; the berth had been stripped of the huge shores like tress trunks, bilge blocks and wedges. “Q4” rested on two sliding ways, each formed of 25 lengths of timber 30 feet long, six feet wide and 12 inches thick. The sliding and standing ways had been greased with a concoction of nine tons of tallow compound, 70 gallons of sperm oil, 14 cwt. of soft black soap and seven gallons of fine spindle oil. Robert Craig took responsibility for this. The ship was held by six mighty triggers, each with its eight-inch wooded tongue set into the sliding ways. Wires trailed from a tiny electrical device to the button on the high platform where Her Majesty The Queen would perform the launching ceremony. As The Queen pressed the button, the powerful trigger arms would snap back in their pits with a report like an artillery salute. Then “Q4” would glide towards the river; and just in case the liner is reluctant to leave the berth, two hydraulic rams would give her a nudge – a push with the power of 1,200 pounds per square inch behind it. In the river, six tug boats would be waiting to handle the ship – three at the fore and three at the aft. Another tug would be standing by for any emergency. Towing lines would be rocketed from the tugs and secured to the new Cunarder, and and the new ship would move towards her fitting-out berth. The final selection of names for “Q4” had been decided in May by Cunard Chairman Sir Basil Smallpeice and his deputy Ronald Senior. On the evening of Monday 18 September, they met in Cunard’s London offices. Sir Basil removed a list of three names from a safe. They then agreed on the final choice. A message was immediately sent by scrambler telephone to The Queen through her private secretary, Sir Michael Adeane, in Balmoral. They were the only four to know the name. 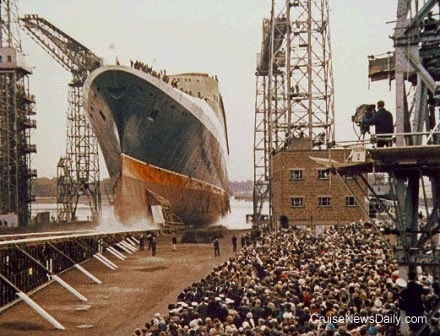 The name “Princess Margaret” became the 4-to-1 favourite on the eve of the launch when it was announced at the last moment that Princess Margerate would also be attending the launch ceremony. Workers had chalked “Princess Anne” on the liner’s hull – that was the name Master Designate Captain Warwick liked. “Prince Charles” carried the shortest odds. On the eve of the launch, thousands turned out to take one last look at the new liner on the slipway. The Queen had her first view of the liner as she flew overhead prior to landing at Abbotsinch Airport, Glasgow, at 1140 hours. She was then driven to the shipbuilder’s offices. There she met by Admiral Sir Angus Cunninghame Graham, Lord Lieutenant of Dunbartonshire, who presented Sir Basil Smallpeice and shipyard Chairman Lord Aberconway to Her Majesty. After a private luncheon party in the Boardroom, The Queen then made the two-minute car journey to the launching berth, where she and the Duke of Edinburgh spent 20 minutes inspecting the launching arrangements. Lord Aberconway’s eight year old son, Michael McLaren, presented The Queen with a bouquet. the secret and announce the name before launching the new ship into the Clyde (below). The thin cheer in the yard came from the 30,000 or so spectators as The Queen announced the new Cunarder’s name. She cut the ribbon using the same gold scissors that her mother had used to launch Queen Elizabeth in 1938 and her grandmother to launch Queen Mary in 1934, which released the bottle of wine which duly smashed onto the side of the newly named liner. She then pressed the button that electrically released the launching trigger. Then nothing happened. For 70 seconds, it seemed as if the ship did not move. The Queen looked amazed; the smile slowly faded from Prince Philip’s face. Workmen high up on her deck leaned and shouted “Give us a shove!” Shipyard director George Parker joined in the spirit of the request and bowler-hatted, he sprang to the bows and gave the liner a shove. He jubilantly waved his bowler when, by a coincidence, she began to move. 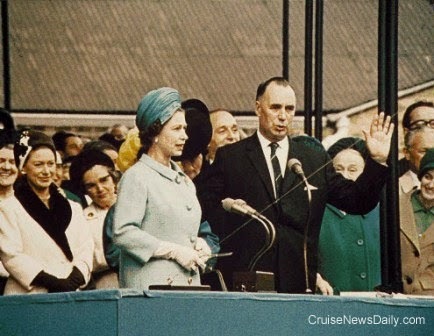 In a little over two minutes after The Queen had named her, the new Queen Elizabeth 2 had slid smoothly into the Clyde. Afterwards, Cunard remained buoyant and claimed there was nothing unusual in the delay, as the ship began to move as soon as The Queen had pressed the button but only a fraction of an inch at a time. Aircraft from the No 736 Squadron of the Fleet Air Arm flew over the ship in an anchor formation as an aerial salute as the six tugs waiting for her on the Clyde maneuvered her inch by inch into the fitting out basin. 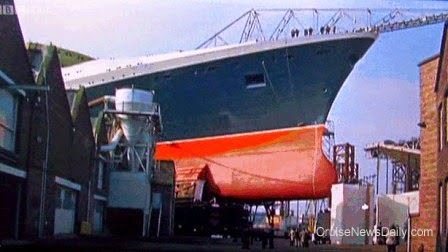 The ships were just getting too big to be built on the Clyde River, as show in this photo of QE2. If the tugs had not done their job, at the ship’slaunch the stern would have been wedged intothe farmland (left) opposite the John Brown shipyard (right). If that had happened, QE2 would have been declared a total loss and scrapped on the spot! The Queen and the Royal party and guests then went to tea in the works canteen. In a speech The Queen said, “Lord Aberconway, I am most grateful to you for the very kind and generous words you have used in proposing my health and that of my family. But the people who really deserve a toast today are the designers and builders of John Brown’s last great ship for the Cunard fleet. Today’s launch marks the culmination of the first stage in an immense team effort, involving many skills and highly complex organization. We hear so much about the new technological age and all the new industrial methods, but we seldom have an opportunity to see all the most advanced techniques brought together in the shape of one single product. “This new ship is designed and built to carry passengers, but to the world she represents the present day standards of British engineering, management and workmanship. I have every confidence that she will be a worthy representative. There is much more to be done before she goes into service, but I take this opportunity to offer my warmest congratulations to every individual man and woman in office and workshop who has made a contribution to the design and construction of the new QE2. “I particularly welcome the opportunity you have given me to launch this splendid successor to those two famous Cunarders, Queen Mary and Queen Elizabeth. I suppose these two ships were better known and loved, both in peace and war by all of us living in these lands, than any other merchantman in our history. I have always had a very special affection for them because they were named after my grandmother and my mother, and it does not seem very long ago that I was present with my sister when my mother launched the Queen Elizabeth in 1938. “Every great enterprise has an element of risk and uncertainty about it, and I am sure that no one can predict the future career of the new Cunarder. However, I am equally certain that in the experienced and capable hands of the Cunard Company she will stand the very best chance of a happy and profitable lifetime. “We have all read, with a touch of nostalgia, that the name of John Brown is to disappear from the list of great ship builders. However, this does not mean that the very special skill and spirit of this yard will be lost to Clydeside or to British shipbuilding. In wishing Queen Elizabeth 2 a long life and good fortune on all her voyages, I add my very best wishes for success and prosperity to the new consortium of Clydeside ship builders”. Aboard Queen Mary – making her 1,001st and final Transatlantic Crossing – Captain Treasure Jones led the singing of “Auld Lang Syne” in the first-class lounge. The name “Queen Elizabeth the Second” immediately caused controversy. “Unimaginative” was the typical English reaction, but in Scotland: “insulting,” “provocative” and “disgraceful” were used. The Scottish Nationalists took it as an insult to the people of Scotland. To them The Queen was Elizabeth the First. As Mr. Arthur Donaldson, chairman of the Scottish Nationalist Party, said, “It could not be a bigger insult to the people of Scotland.” However, more than 500 calls were made to the various offices of Cunard Line in the United Kingdom to congratulate the company on the choice. Later, Sir Basil would confirm that the three names in the safe were Queen Elizabeth, “Princess Margaret” and “Princess Anne,” with Elizabeth joining the list last after the decision to retire the Queen Elizabeth had been made. The newest addition to Norwegian Escape is going to be Miami’s oldest bar. Tobacco Road was issued Miami’s very first liquor license in 1912, and it is therefore the city’s oldest bar. After 102 years, the landmark is closing this week in Miami, but it’s going to live on aboard Norwegian Escape. NCL has partnered with Tobacco Road to bring the legendary establishment aboard its Miami-themed ship when it enters service from Miami next year. Passengers aboard three Princess ships are about to have a new choice when they are considering souvenirs to bring home from their cruises. Princess has formed a partnership with Effy Jewelry, the premier American line of diamond and gemstone jewelry, to open stand-alone fine jewelry stores aboard three Princess vessels beginning next month. The point of naming ceremonies these days is to get attention for a ship - to grab media coverage and to at least momentarily get the new ship in front of as many potential customers as possible. New ships aren’t the rarity they once were, so unless the ship has some really unique new feature, the cruise line has to be pretty clever to come up with something that will make media stop and look and run the story. The people in Princess Cruises’ PR Department are geniuses at hitting on just the right idea. (Has anyone forgotten the Duchess of Cambridge named Royal Princess?) I thought they had hit a home run when announced they were bringing together the entire original cast of “The Love Boat” to be godparents of Regal Princess. No media outlet is going to be able to resist that. If that was a home run, for insurance, Princess’ PR Department has now come up with a back-to-back grand slam that no media outlet is going to be able to let slip by. Ft. Lauderdale’s port served up two new digital offerings just in time for the winter cruise season. Seattle, Wash., Oct 21, 2014 – Mark Kammerer has been named vice president, international marketing and sales for Holland America Line and Seabourn. In this role, he will be responsible for the companies’ sales offices in the U.K., the Netherlands and Australia, as well as Holland America Line and Seabourn’s growing international business. Kammerer will report to Joe Slattery, Holland America Line’s senior vice president, global marketing and sales. In his previous positions at Holland America Line, Kammerer was responsible for marketing and North American sales, as well as worldwide cruise marketing. Prior to joining the cruise line, Kammerer worked at several leading travel industry organizations including Virtuoso and Expedia Inc.
Seattle, Wash., Oct 21, 2014 – Joe Slattery has been promoted to the position of senior vice president, global marketing and sales for Holland America Line. In this newly created role, Slattery will oversee marketing and distribution in all worldwide markets, developing and executing initiatives that support Holland America Line’s revenue growth objectives. Slattery — a 21-year company veteran — will continue to report to Richard Meadows, Holland America Line’s executive vice president, sales, marketing and guest programs. Since 2008, Slattery has been Holland America Line’s vice president, international sales and marketing. Since joining the company in 1993 as a marketing product manager, Slattery has accumulated a wide range of experience in multiple executive roles, including vice president, revenue planning, and vice president, revenue marketing, where he was responsible for deployment and itinerary planning, revenue management and direct marketing. Carnival Cruise Lines UK today announced two new executive promotions with Iain Baillie named managing director of UK sales and Erin Johnson UK marketing director. With 20 years of experience in the travel industry, Iain Baillie joined Carnival Cruise Lines UK in 2012 from Complete Cruise Solutions representing P&O, Cunard, and Princess as a senior sales manager. Baillie’s appointment to managing director of sales at Carnival Cruise Lines UK follows a hugely successful execution of trade sales achieved through key trade partners as well as forging new relationships across the UK and Ireland. Erin Johnson began her career at Sea Vacations in 2001 as a sales and marketing coordinator, swiftly progressing up the ranks and eventually being appointed marketing manager for Carnival Cruise Lines UK. During her tenure with Carnival, Erin has developed a number of successful marketing initiatives, including the creation of a specialist UK website for agents and consumers and overseeing a multi-million-pound advertising campaign in 2013. Both Iain Baillie and Erin Johnson will continue to report directly to Adolfo Perez, vice president, new market and new product marketing. Carnival Magic returned to Galveston on Sunday without any of the drama that had met it at its previous two port calls. The lab technician aboard who was under quarantine due to the possibility that she had been infected with ebola was pronounced free of the disease, and she reportedly was escorted off the ship as soon as it arrived, and was allowed to drive home without restrictions. There was a different kind of christening ceremony in Hamburg on Saturday. While it had all the trappings of naming a cruise ship, complete with a cruise line executive serving as the godmother, it wasn’t a cruise ship being named, but rather a barge. 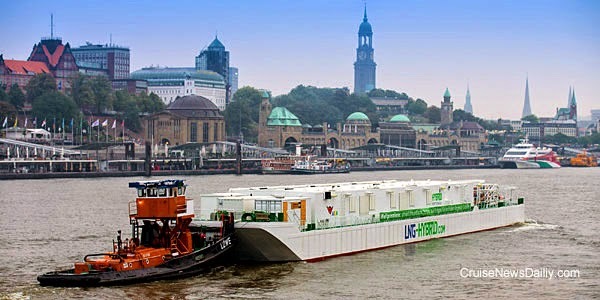 Not just any barge, it is a special barge. 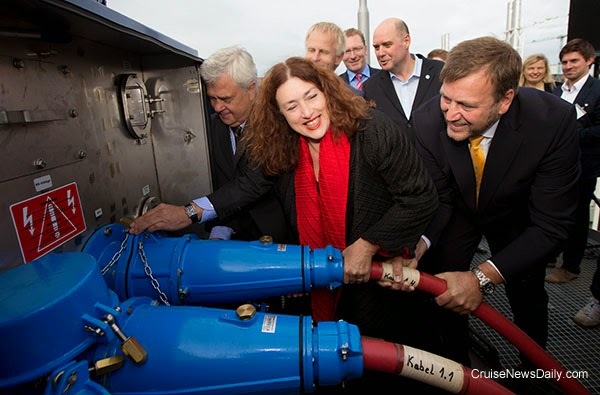 AIDA’s Chief Sustainability Officer, Dr. Monika Griefahn was christening, Hummel, the world’s first LNG (liquefied natural gas) hybrid barge, designed to supply berthed cruise ships with electrical power. CND subscribers also read about Bermuda being back in business ... and a delayed delivery. 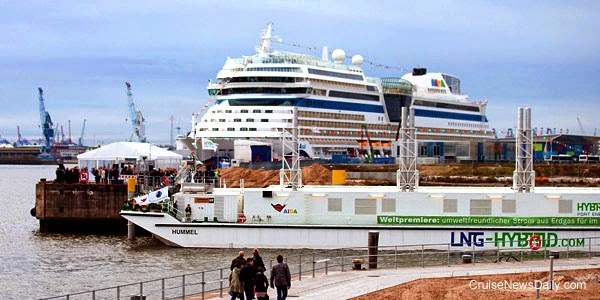 On Saturday in Hamburg, AIDA’s Chief Sustainability Officer, Dr. Monika Griefahn christened Hummel, the world’s first LNG (liquefied natural gas) hybrid barge, designed to supply berthed cruise ships with electrical power. When it’s fully operational next spring, Hummel will be providing a sort of shore power, first to AIDAsol, when its docked in Hamburg. It will produce electricity from the LNG, and supply the cruise ship with power so it can shut down its engines while in port and not burn fuel which would put pollutants into the air. Providing power this way is cleaner than from shore power produced by the power plant burning coal or oil. Hummel is a joint project between AIDA and Becker Marine Systems. As part of the inaugural event, Dr Griefahn helped plug in the connection between Hummel and AIDAsol. 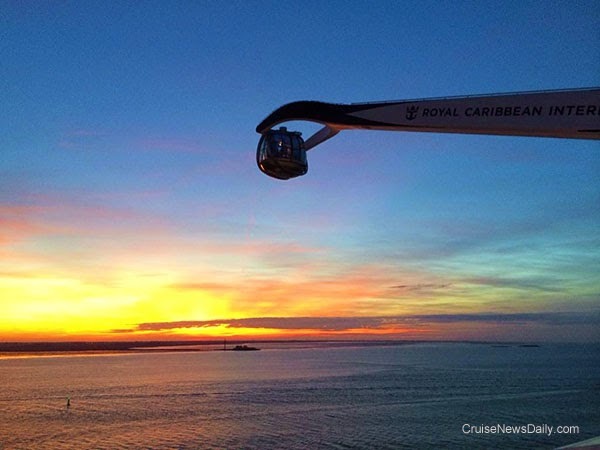 Photos courtesy of Becker Marine Systems and AIDA Cruises. All rights reserved. May not be copied or used without permission.